Albert van der Sel : linear equations. For who: for absolute beginners. Maybe you need to learn basic "mathematics" rather quickly. 1. Positions in a Coordinate Sytem for the "plane". In a flat "plane", we often should be able to pinpoint, or exactly describe, positions. Long time ago, mathematicians deviced a rather nifty method to accomplish that purpose. "the Origin". Next, two perpendicular "axes" are drawn, which intersect exactly at the Origin. The horizontal axis, is called the "x-axis". The vertical axis, is called the "y-axis". So how do we pinpoint "points" in that Coordinate system? Figure 1. Coordinate system (in the plane). From the Origin (O), if you take 3 steps to the right, you are at x=3. Or more precise, if you take 3 steps to the right, you are at x=3 and y=0, since you never moved "up" or "down"
along the "y direction" at all. In the next example, we will move in both the x- and y directions. From the Origin (O), if you take 3 steps to the right, you are again at x=3. arrive at x=3 and y=2. The way how often mathematicians write that down is: we are at point (3,2). Do you see the point (3,2) in figure 1 above? We do not only have positive numbers like 1, 3, 12, 1000 etc.., but negative numbers as well. Those are numbers like, for example, -1, -3, -12, -1000 etc.. In the Coordinate system, if we take steps to the right on the x-axis, we go to points like x=1, x=7, etc..
than using different numbers. You know, the positive ones are already taken. you go to x=5. But, if you, from the Origin, take 5 steps to the left, you end up in x= - 5. In such a way, 5 steps to the right, or 5 steps to the left (from "O"), have the same absolute distance. In fact, only this way we have a truly usable Coordinate system. As a last example, note the point (-3, -3) in figure 1. It means: x= - 3 and y = - 3. If you want to "pinpoint" the position, you may say: it's the point where x= - 3 and y = - 3. But it's much easier to pinpoint it by using the notation (-3,-3). I take 3 steps down along the y-axis. 2. Linear equations: they are just "lines" in a Coordinate system. Next we are going to study "linear equations", which are equations of the form "&Yscr;=a&Xscr; +b". I will explain the equation in a minute. But first a few words on how we write it down. along the x-axis, and not the multiplication symbol. That symbol is usually simply left out. Now about the meaning of such equation. If you see such a formula for the very first time, I can understand that you think "What is that!???". by specifying the exact "x" and "y" for such a point, like for example the point (2,4). Let's take a look at a specific example, like "y=2x". Table 1: calculate "y" for a number of x values. 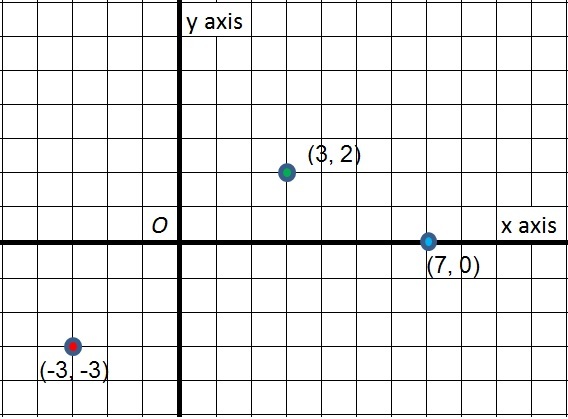 In figure 2, we simply have plotted the points from Table 1, into the Coordinate system. If we connect those dots, we simply get a line ! See the red line in figure 2.
for a certain number of x values), we then find a line. A line is also often called "a linear equation". So, an equation like "y = ax", where a is just some constant number, can be represented by a line. You could perform a similar action for other equations like for example "y=5x" etc..
By the way: note that for drawing a line, you actually need only two points. You may ofcourse calculate for a larger number of "x-values", what then the resulting "y-values"
will be, just like we did in Table 1. But actually, doing so for 2 points only, is enough. So, we analyzed the equation "y=2x" and saw how we could plot points in the Coordinate system. That example stands model for any sort of such equation "y=ax", where "a" is some number. So, what's the story with "b"? Well, in figure 2 I have placed the example line "y= 2x +3". 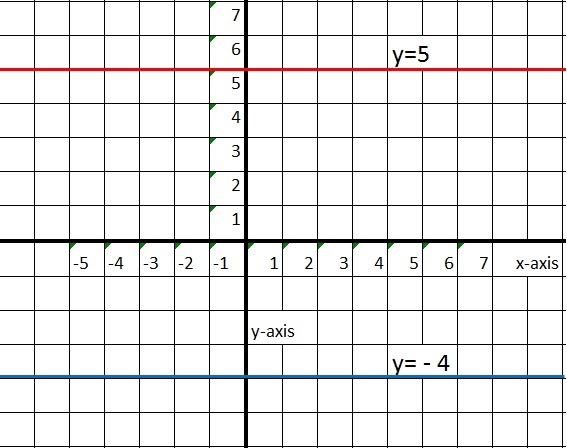 Note that for all x on the x-axis,, that line is exactly "3" above "y= 2x"
So, it's always 3 above "y= 2x" with respect to the y values. compared to the equation "y=2x". In figure 2, notice the blue line. It's the line "y=2x +3". Question: could you create a similar table like Table 1, but this time for "y=2x +3"? By the way, the answer can be found in figure 2 as well. Note the column on the right side. For example, you do not need to draw a line first in a Coordinate system. Say x=30, then y=7x30 + 5 = 215. And that holds for any "x". Just do the calculation, and you know the value of the corresponding "y". In general, we have the equation "y = ax +b", where "a" and "b" are some specific numbers. For each different "a" and "b", we have a different line in the Coordinate system. However, what happens if "ax=0"? Then we simply have "y=b". This means that, for every x along the x-axis, y remains the same, namely "y=b". So we could have the line "y=5", or "y=-7" etc.. These lines are parallel to the x-axis, since y remains constant. Figure 3. Some examples of the equation "y=b" (thus y is constant). This time, we will take a look at the line "y = -3x + 2". new in this business, you just need an example of such a case. Let's draw the line, with the help of a table, similar to Table 1. But..., you need to know a certain fact beforehand. Maybe you already know this, or not, in which case in cannot hurt. a positive number X a negative number = a negative number. For example 5 x -5 = -25 (note the "-" signs). a negative number X a negative number = a positive number. For example -5 x -5 = 25.
which will put you at x=25. which will put you at x= -25.
which will put you at x= 25. Indeed, a "negative number" times a "negative number" is positive. Table 2: calculate "y" (y = -3x + 2) for a number of x values. Figure 4. The line y = -3x + 2. Ok, let's go to the next and last section. between x and y in the entire Coordinate system. Solving an equation can mean that you can calculate a specific "y" value for a specific "x". What is the value of "y" if x=3 for the equation y=5x +2 ? Answer: y= 5 x 3 + 2 = 15 + 2 = 17. However, what is usually meant by solving, is finding "special points". 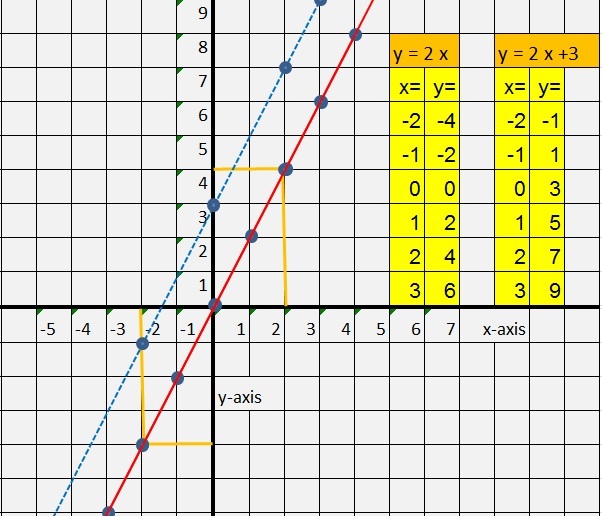 Any line (except the horizontal and vertical lines), will "intersect" with the x-axis and y-axis. At such a specific point, thus where the line crosses the y-axis, then we know for sure that "x=0". Take a look at the figures above. From those examples, you can really see that at intersection with the y-axis, then x=0. For example: the line y=2x + 3 crosses the y-axis at: x=0 and y=3, or the point (0,3). 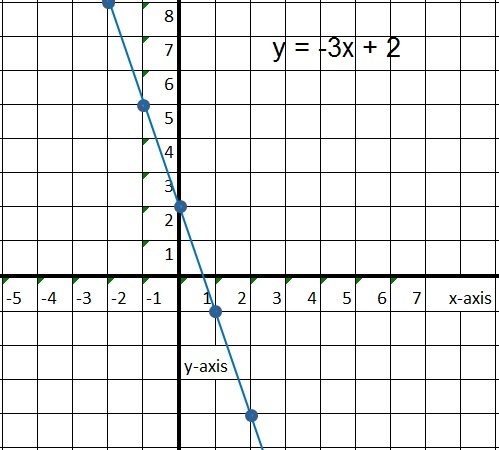 If a line crosses the x-axis, then at that specific point, y=0. Take a look at the figures above. At the x-axis, the height of y is zero, so y=0 at that point. So, this line intersects the x-axis at x=-2, or at the point (-2,0). there can only be one such point. See figure 5 for an illustration. One thing is for sure: where they intersect, at that one point, the lines share the same "x" and "y". Since an equation stays the same if on both sides of the "=", the same is added. the y-coordinate. Let's use "y= -x - 1". Thus y = -2 - 1 = -3. Thus we have found the point (2,-3), where both lines intersect. In this short section, we will do no calculations at all! It's just good, to introduce a few formal terms here. then mathematicians also say that y is a "function" of x. This is also written as f(x). In other words, each "y" depends on a certain "x", and y is defined by ax +b. It's absolutely no more than a "formal" way of saying things. x is mapped to y, or x -> y (which is a short form of saying "x is mapped to y"). The next note as about quadratic functions and higher order polynomials.